On February 11, 2010 the exhibition Crash: Homage to JG Ballard opened at the Gagosian Gallery in London. Organised in tribute to Ballard who had died in April the year before, the show featured the work of a number artists who had a direct personal connection to Ballard, such as Eduardo Paolozzi, and others who Ballard had often name checked in his fiction, Surrealists such as Salvador Dali and Pop artists including Andy Warhol and Roy Lichtenstein. Artists who had directly quoted Ballard, such as Ed Ruscha whose text painting Fountain of Crystal  featured prominently in the promotion for the show, shared gallery space with younger artists such as Tacita Dean who had established a relationship with the author via a series of projects that investigated Robert Smithson’s iconic land artwork Spiral Jetty . Other artists featured had only a respectful distance to Ballard himself but had an allegiance to his work and aesthetic. Among them was an arresting piece by the British artist Adam McEwan. Laid out on the floor of the gallery and measuring some 350 x 300 x 182cms, the sculpture Honda Teen Facial  was a section of an actual Boeing 747 undercarriage complete with wheels. For this viewer at least – and observing the show and its artworks from the distance of online documentation – McEwan’s work seemed to tick all the boxes of the Ballardian aesthetic: a provocation very much in keeping with Ballard’s own installation of crashed cars at the Camden Arts Lab in 1970, but also a mysterious out-of-context object that connected, on the one hand, to Ballard’s repeated invocation of aircraft and air travel in his fiction but also, on the other hand, to the author’s oft repeated citation of the airport as a metonym for the contemporary condition. Despite these connections McEwan’s work was considered by many as an outlier in the exhibition when compared to the paintings of artists such as the Surrealist Paul Delvaux whose work – in reproduction – graced the author’s home. Beyond the exhibition itself, McEwan’s found object draws the ire of art traditionalists who, while sympathetic to Ballard, like their avant-garde art in an early 20th century style or not at all, while the reposting of images of Honda Teen Facial on social media inevitably draws comments proclaiming that it’s ‘not art’. Like many dictionary definitions, the adjective ballardian is precise but also allows for a degree of interpretation. The Ballardian aesthetic might be that which resembles or suggests “…the conditions described in Ballard’s novels and stories, especially dystopian modernity, bleak man-made landscapes” it can also be applied to “…the psychological effects of technological, social or environmental developments” [Collins Online Dictionary]. For the literal-minded, however, Ballardian landscapes are those that recur in his fiction – highways, shopping malls, outer suburbia, gated communities, spaceports and airfields – and even more so if described as abandoned. But beyond those sites and landscapes – and the Pop and Surrealist art that influenced him – could there be a potentially more expansive conception of what constitutes a Ballardian aesthetic? And what sort of art might connect to it? My first encounter with the Ballard short story Report on an Unidentified Space Station wasn’t in a short story collection or anthology, or even a magazine, but in Nothing, a publication that coincided with an art exhibition held at the August and Northern Gallery of Contemporary Art in 2011 and that toured from Sunderland in the UK to Vilnius, Lithuania and then to Malmö, Sweden, between April and December, 2001. The idea for the publication was to expand the humble catalogue into a hardback book that would act as a companion piece to the show, where the writers, photographers and artists whose work was contained within were meant to provide an expanded field of ideas and reference points to the show’s curatorial concepts, and so Ballard, along with Jorge Luis Borges and Isaac Asimov and other writers, rubbed metaphorical shoulders with photographers such as Andreas Gursky, painters including Capsar David Freidrich, the performance art duo Gilbert & George and conceptualists such as Martin Creed and Francis Alÿs, providing a range of pieces that explored the conceptual space between absence and presence. Ballard’s story certainly fitted the curatorial brief. First published in 1984, Report on an Unidentified Space Station is notable for a few reasons. First, it’s an atypical Ballard story in that’s set in outer space, complete with spacecraft, exploration and an encounter with an alien object. It also has a passing resemblance Arthur C. Clarke Rendezvous With Rama . Like Clarke’s novel, Ballard’s spare short story shares a similar tale of exploration, and an inscrutable alien logic borne out by the architecture and décor of the station itself. But with typical Ballardian perversity, the encounter doesn’t reveal an exotic world, but instead the explorer’s discover what the reader recognizes to be a facsimile of a late 20th century airport, complete with lounges and boarding gates, restaurants, corridors, concourses, staircases and mezzanine levels. As Ballard’s unnamed explorers venture ever on into the heart of the station they soon discover that it’s growing, each area apparently replicated with only minor variation until, at the conclusion of the story, the station has expanded to an unimaginably vast 15 million light years. The seed for this story lay in many of Ballard’s earlier fictions but a non fiction essay that appeared in the magazine Blueprint in 1997 the author virtually summarised the concept for his short story: “Airports and airfields have always held a special magic, gateways to the infinite possibilities that only the sky can offer.” The essay touched upon many of his familiar themes, valorising the airport as an ideal community of tomorrow, an agglomeration of units rearranged depending on the airport’s location, climate and purpose, but essentially built from the same model. This perpetually remade architecture offered a kind of liberation: “We are no longer citizens with civic obligations, but passengers for whom all destinations are theoretically open […] Airports have become a new kind of discontinuous city, whose vast populations, measured by annual passenger through-puts, are entirely transient, powerful and, for the most part, happy.” In the days before 9/11 and the imposition of border checks and security measures that now make international travel a tedious and sometimes physically arduous experience, Ballard had taken the utopian prospect of the shopping mall and applied it to one of its newest manifestations: the contemporary airport. The playfulness of Ballard’s short story – and those occasions when he would herald the airport as a harbinger of tomorrow – was no doubt partly satirical, but also an example of a sincere and undeniably prescient understanding of what those kinds of projects mean in a cultural sense. As noted above, Ballard had a knowledge both of Robert Smithson’s Spiral Jetty as well as an interest in interpreting its possible meanings – [see Cosmic Sentinels and Spiral Jetties: J.G. Ballard, Robert Smithson & Tacit Dean] – for a discussion of those fascinating connections -but what is also curious is another connection between Ballard’s thinking on the airport and one of Smithson’s unrealized mid-1960s projects. 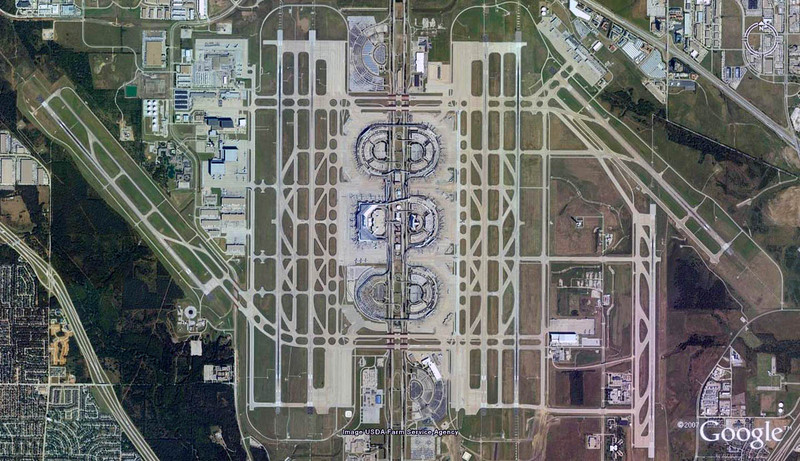 Smithson was contacted by Tippetts-Abbett-McCarthy-Stratton, the architectural firm that had been contracted to design a new airport at Dallas-Fort Worth, to act as a consultant with a view to developing some kind of art project there. As Janna Eggebeen writes in Airport Age: Architecture and Modernity in America, the conceptual impetus was to design an airport from the ‘air down’ and that the final airport would function as a transition point between land and sky. Between mid 1966 and late 1967, Smithson worked on the TAMS concept, immersed in schematics, plans, air corridor simulations and computer data, designing possible land art installations and between-runway paths that would only be visible from the air, but ultimately nothing came of the artist’s plans. Smithson’s involvement was, however, a key influence in his formulation of the concept of the non site, a conceptual transaction between a physical place and its representation in maps, earth samples, photographs, films and documentary materials, be it in an exhibition, publication or screening. The resonances between Smithson’s project and Ballard’s writing are remarkable. The familiarity of the modern airport contrasted with macrocosmic space-time as it emerges in an immaterial zone just above the concrete tarmac is an idea at the heart of the Ballardian aesthetic, one that connects Smithson’s project to the concept underlying Report on an Unidentified Space Station, but also suggesting something more expansive than the often bland reiteration of the images conjured in Ballard’s fiction. The American deserts of Texas and the American South West has long been a place of utopian dreams and hidden technologies, where a monumental piece of land art might occupy the same desert landscape as a secret air base or a nuclear testing site. If the Dallas-Fort Worth airport is a Ballardian site, so too then is Marfa, Texas, the home of The Chinati Foundation. Initially conceived as a place to exhibit permanent installations by Donald Judd, John Chamberlain and Dan Flavin, the foundation now occupies 340 acres of land on what was once a former army base, but now looks like a research centre into minimalist geometric objects. First opened to the public in 1986, the Chinati Foundation is primarily associated with Judd, partly because it was Judd who had moved to Marfa in the early 1970s and had begun buying land and abandoned aircraft hangers in which to display his work, but also because the 15 sculptures he created that sit on one perimeter of the foundation’s compound are among the most visible external art works at Marfa. Judd’s 15 Untitled Works in Concrete [1980-84] is a series of concrete boxes made of slabs 25 centimeters thick and measuring 2.5 x 2.5 x 5 metres each. Set out at 60 metre intervals in a variety of arrangements but ultimately forming a cohesive line, Judd’s work achieves at a grand scale the sorts of effects only hinted at in the smaller works he exhibited in a gallery space. Like other artists who were fascinated by the possibilities of the repetition of simple forms, Judd’s large concrete sculptures take on the same kind of imperial majesty as the grey highways, landing strips or causeways of a NASA launch facility, or perhaps the expansive fields of sun blasted airport or shopping centre car parks. As the Museum of Modern Art, New York’s MoMaLearning website notes, classic minimalists “…stayed away from traditional art materials, and instead embraced the techniques of manufacturing, commercial materials, and industrial fabrication in order to eliminate the evidence of the artist’s hand normally found in, for example, brushstrokes.” In essence, while attempting to achieve a kind of seamless and frictionless artwork that had the outward visual and tactile perfection of a manufactured object, artists such as Judd had turned to industrial fabrication to produce their art. In doing so, they had also created an endlessly replicable object that could be assembled and reassembled into potentially near-infinite variations on a theme. In Report on an Unidentified Space Station Ballard created a story that made comment on the virtually infinite replicability of the airport itself, and the seemingly endless iterations of their design and décor, as it seems to the subjective experience of a modern air traveller. But it’s within Ballard’s idea that his near-infinite space station is made of discreet units that connects to a consideration of a Ballardian aesthetic in the work of artists such as Smithson and Judd, and the projects that connect either directly or conceptually to Ballard’s thinking. The kinds of landscapes and places that Ballard habitually conjured in his writing have undeniable power but taken solely as the definition of the Ballardian is not only too limiting in terms of what that term might potentially mean, but also does a disservice to the concepts and ideas within Ballard’s writing itself. Published in Deep Ends: The JG Ballard Anthology, 2015.